Tees Components is creating two apprenticeship positions as the heavy machining expert continues to grow its workforce. The latest opportunities are part of an ethos reflected by the fact that 40 percent of its skilled workforce started as apprentices with the award-winning family firm. Recruiting an additional two new trainees will take the company’s cohort of apprentices to six. Managing Director Sharon Lane – who herself swapped studying a degree for an apprenticeship in engineering – believes the responsive system is one of the bedrocks of the company’s success. 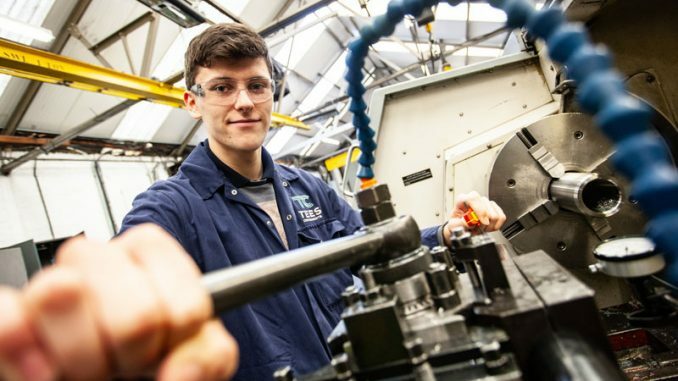 The two apprenticeships are in mechanical engineering, specialising in machining, and will last up to four years, depending upon any previous industry-related qualifications. In addition to learning on the job at Tees Components, the apprentices will also work towards NVQ qualifications. Most of the company’s management at its six-acre site at Skelton, near Saltburn, are also former apprentices and over the years Tees Components has strengthened its links with local schools and training providers, including Middlesbrough College STEM Centre, Redcar & Cleveland College and TTE Technical Institute. Since it was founded in 1963, Tees Components has developed into one of the country’s most comprehensive and versatile heavy machinists, operating more than 20 CNC machines producing precision parts 24 hours a day. It has been involved in many high-profile complex projects including the Channel Tunnel, Wembley Arch, Humber Bridge and Transport for London’s Bond Street station upgrade. “Ours is a versatile and niche service and our healthy long-term order book rests upon a continuing investment in the company and our engineers’ expertise. “We are very fortunate to have an incredible skillset in the business, together with high retention rates, due largely to the apprenticeship system and the strong relationship we have with the local community. Quality Engineer Chris Thompson, himself a former apprentice, said: “It is an opportunity for people like me to pass our knowledge and skills on in a work place setting, allowing apprentices to gain a much greater understanding of what is required of them. “It’s great to see them develop in confidence over time as they move up through the company to become highly-trained mechanical and electrical engineers. • Pictured top: Current Tees Components apprentice Jake Greenhalgh who will be joined by two new soon-to-be-recruited apprentices.